It's no secret I love cooking and crafting so when I was gifted the book, A Year of Cozy---a cooking and crafting book, I was super eager to try out new recipes and new crafts. 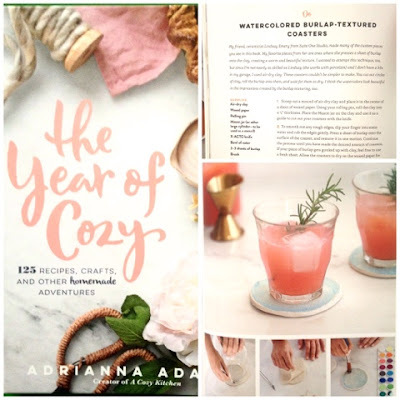 (Adrianna, of the blog A Cozy Kitchen wrote a lovely book to brighten up your life with happy moments filled with cooking, crafting and exploring new things). Her craft for watercolor coasters seemed like the perfect Christmas gift for me to craft this season. 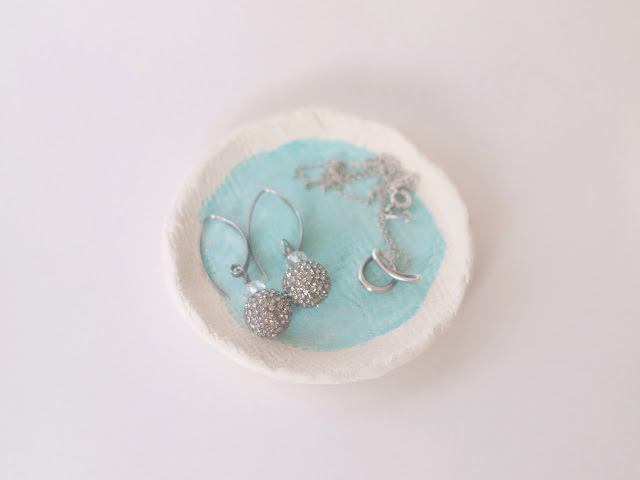 But since I just took a craft class making coasters, I decided to mold the clay into cute jewelry bowls---as a girl who loves earrings, I can never get enough of little dishes to hold my earrings that don't fit on my earring stand. Working with air dry clay brought me back to art class when my fingers would get extra messy working with clay. But no kiln is necessary for this craft; just some time to dry and patience. So plan ahead so you don't find yourself a day before Christmas hoping the clay will dry miraculously. 1. Cover your workspace with a long sheet of wax paper. Take a small piece of clay and roll into a ball. Take rolling pin and flatten clay ball until it is a 1/4 inch thick. Then use mason jar or circle cookie cutter to cut out a circle. 2. 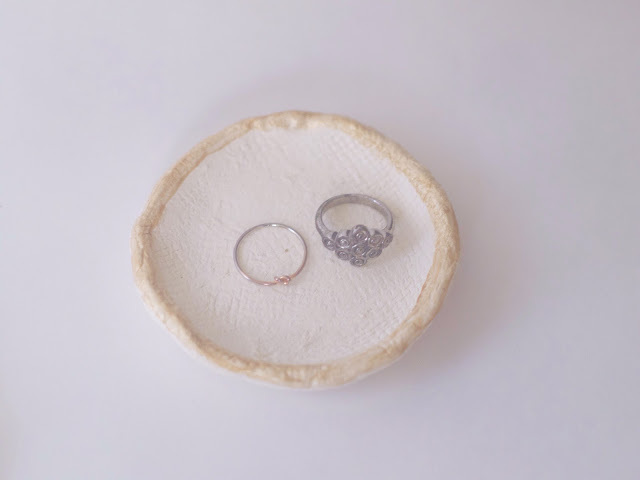 Take burlap and press lightly onto the clay circle. Gently lift burlap from clay. Take smaller sheet of wax paper and line it in the prep bowl. 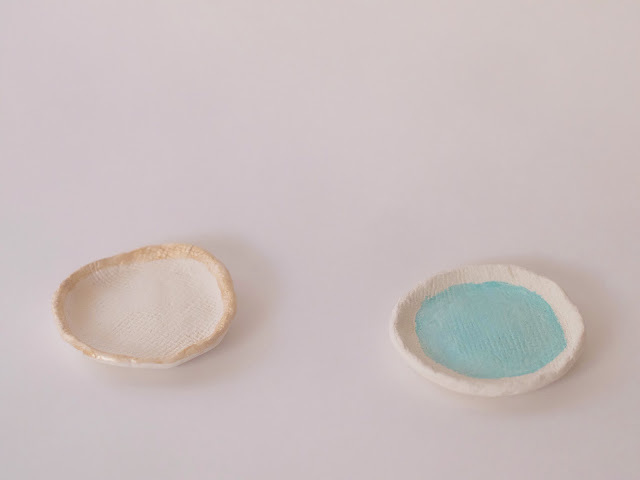 Take the clay circle and play on top of wax paper in the bowl. Shape the clay until desired bowl shape is created. Remove clay from bowl. 3. Lightly wet fingers with water and smooth out clay to remove any lines and bumps. Further molding by hand may be necessary to achieve the desired bowl shape. Let dry on wax paper for at least 48 hours. 4. Sandpaper lightly any rough edges on the bowls. Line workspace with newspaper. Paint desired design onto dry clay bowl: outline edges or paint just on the inside of bowl. 5. Let paint dry and enjoy holding your jewelry inside the bowl.